This year’s event highlighted a number of new trends across the industry and collectively with bioLIVE – the bioprocessing and manufacturing exhibition added in 2018 – played host to more than 150+ sessions. Held at the IFEMA center in Madrid (October 9-11), attendees came from a record 164 countries, with 47% at C-level or above. The standout new addition at this year’s event and one of the biggest overall trends to emerge is the integration of small and large molecules – with bioLIVE bringing the biologics supply chain into the wider CPhI family. Sessions here highlighted the developments in ‘cell and gene therapies’, ‘biosimilars’ and ‘capacity challenges in Europe, USA and Asia’, as well as new manufacturing and processing techniques – spanning 45 hours of insights over three days. CPhI Worldwide is widely used as a barometer of pharma’s overall health – as the only platform that brings together global pharma – and a strong event is reflective of a prosperous pharma sector. The industry looks set for an extremely strong 2019, as CPhI Worldwide received more than 103,000 visits over three days. 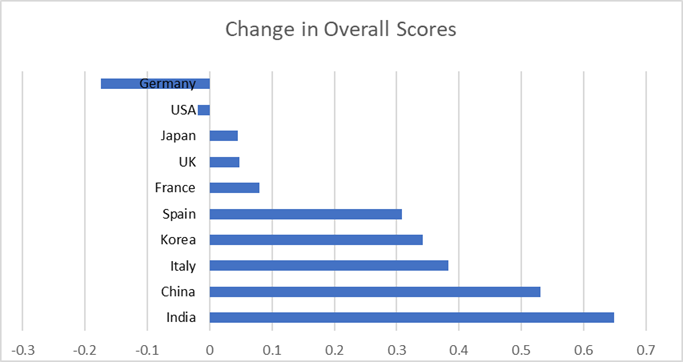 Emphasizing the strength of global pharma over the past year, in the annual survey conducted for CPhI Worldwide (CPhI Pharma Index), eight of ten top nations improved their overall score across all categories – with table topping nations the USA and Germany the only countries not to improve. In fact, for the second year running Germany, Japan and the United States emerged as the top-ranked, tier-one nations for pharmaceutical quality and overall score – with India and China making dramatic strides in raising their overall reputation. Host nation of CPhI Worldwide 2018, Spain, also made a significant improvement with international perception of ‘innovation emerging in the country’ rising – driven notably by the biotech hubs in both Barcelona and Madrid. However, most promising, was the improvement in growth potential industry-wide, as eight out of ten countries’ scores rose – with only Spain and China marginally lower than in 2017. Remarkably, since the last CPhI Worldwide was held in Madrid (2015), the industry has grown extremely quickly with attendee numbers increasing by 9,000 to nearly 44,500. Attendees from the world’s largest pharma economy also continue to grow, with visitors from the USA increasing by 8% in the last year, as well as an impressive 27% rise from South America. The organiser attributes this year’s stellar event to its bespoke customer focus as well as the wider market conditions in pharma. Orhan Caglayan, Brand Director added: “The 2018 CPhI Worldwide event showcased the incredible strength of pharma, and we are seeing good growth potential across all sectors from API and finished product to bio, generics and NCEs. But what has been most significant is the internationalization of partnering; furthermore we see a wider spread of international attendees year-on-year at CPhI Worldwide. Another notable trend and reflected in our content programmes at the event, has been the rise of innovation in the industry, with more new products in development, but also, new technologies that lower overall production costs.